My friend Rose recently filled one of the boxes we pass back and forth with some beauty products for me to try, some familiar and some less so and all of adequate sizing that I could form some opinions to share with you. Kiehls Midnight Recover range is well know and I own the Midnight Recovery Concentrate but not had an opportunity to try the Midnight Recovery Eye Cream until now. With such a positive experience of the concentrate I of course was expecting big things from the eye cream, especially as I've successfully used other creams from Kiehls. I was not let down. Diminishing the appearance of fine lines, reducing puffiness and reducing dark circles it ticks every box. As it's name suggest I use at night and often eye creams of its type can feel quite heavy but not in this case. I have tried MonuSpa's body products so the MonuSpa Renu Nourishing Treatment Oil was a great opportunity to test their skincare products. All natural ingredients such as Rosehip and Blackcurrant Oils to soothe the skin and help maintain suppleness and elasticity a well as amazing scent this is a luxury thick oil which will enhance any evening skincare routine. I find that whilst it's nice to sandwich on top a night cream it isn't entirely necessarily as my skin doesn't 'need it'. Sanitas Lemon Scream Scrub is your typical 'old school' exfoliator, a product in the skincare line up I'm no longer a fan of. I prefer to use exfoliating toners and acids rather than what can often be harsh scrub. Whilst this scrub smells amazing and the grains are not harsh like similar products I still found that it left my skin gritty rather than 'smooth. I was excited to see Skyn Iceland Hydro Cool Firming Face Gels in the box, a product and range I've seen other bloggers share. I've never used this product waiting for a 'big night' out to see how much the claims to fill in the forehead furrows and smile lines for up to 24 hours will do. 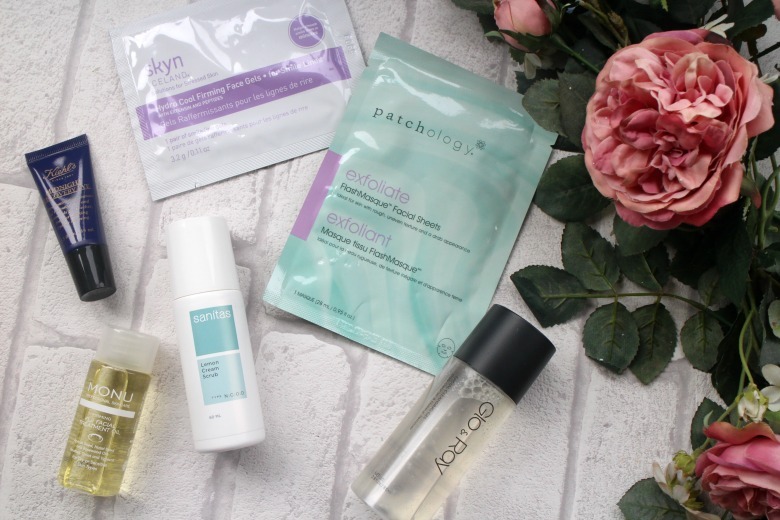 I'll keep you posted along with this and the Patchology Exfoliate FlashMasque. And finally I've thrown into the mix Glo & Ray Facial Cleansing Gel* which allows me to try out my first cleansing gel. This smaller travel size bottle is a little bit of a faff as you have to shake the product out and as it's somewhat thick I'm concerned at how I'll manage when I near the end of the bottle, but aside from that it's a great product. It removes my make up and doesn't leave my skin dry which is all I ask for. It's perhaps not the most exciting or powerful of cleansers, hence I use it as a first stage of cleansing to remove the make up and then go in with something that has a little more bite but otherwise it's a handy one to have and would certainly be ideal for travelling when you want to keep things streamlined and simple. What skincare products have you discovered recently? I recently discovered my love for pixi skin glow, AMAZING!! There's a lovely guy who works in the Kiehls near my office and he's so good at sharing product samples to try out too. It makes such a different to try something and in this instance I'm sure you'll be impressed. I have been discovering tons of local Canadian natural skincare recently which turned out to be so much better than expected. Keihls has been under my radar since forever but I have to order it through online which frankly, I'm not the biggest fan of. I'm not a fan of ordering online but luckily being in London I have access to a lot of brands. Me too, I'm testing so much skincare at the moment and really enjoying it.